Panathinaikos Athens registered its first win in difficult Group D by thrashing injury-plagued Laboral Kutxa Vitoria 95-74 in Nicosia, Cyprus on Friday. 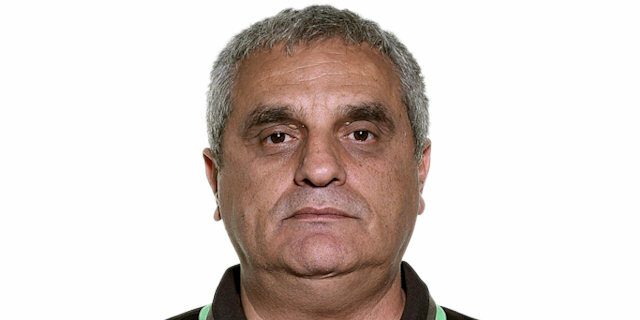 Panathinaikos tied the Euroleague team record for the most assists in a single game with 31 and its 18 three-pointers marked the second-most in competition history. Panathinaikos and Vitoria are now tied with Maccabi Electra Tel Aviv and Lietuvos Rytas Vilnius in a four-way tie for second place in Group D, all with a 1-1 records. Michael Bramos led the winners with 21 points on 7-of-11 three-point shooting. Ramel Curry added 15 and Dimitris Diamantidis had 9 points and 9 assists for Panathinaikos. Andres Nocioni led Vitoria with 23 points and 12 rebounds. David Jelinek added 17 points, Walter Hodge scored 15 and Tibor Pleiss got 10 for Vitoria, which was without Adam Hanga, Lamont Hamilton, Fernando San Emeterio, Leo Mainoldi and Thomas Kelati - all injured. Panathinaikos nailed 6 three-point shots in the first quarter, including a buzzer-beater from Bramos that gave the Greens a 26-16 lead after 10 minutes. 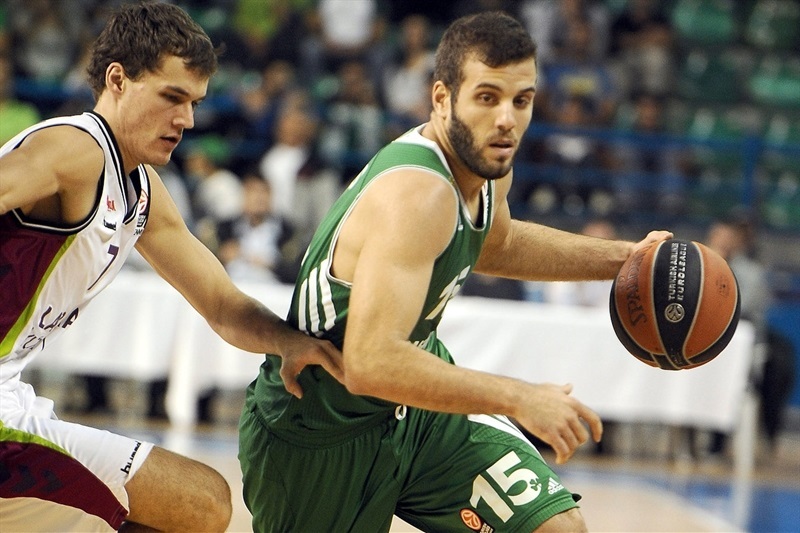 Panathinaikos kept excelling on offense and soon boosted its margin to 44-24 on free throws by Antonis Fotsis. Panathinaikos led 50-35 at halftime and kept finding open shots from downtown, extending its margin to 77-56 at the end of the third quarter as the Greens rolled to victory. Tibor Pleiss got Vitoria going with a second-chance layup, which Jonas Maciulis bettered with a corner triple for a 3-2 Panathinaikos lead. Maciulis kept pacing the Greens with a fast break layup off a steal, and a put-back dunk by James Gist boosted his team's lead to 7-2. 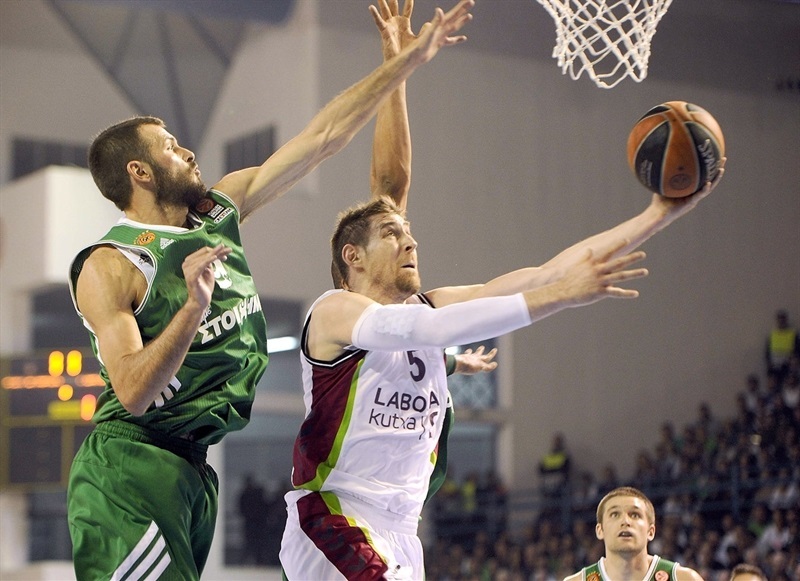 Andres Nocioni split free throws, but Panathinaikos kept playing aggressively at both ends. Stephane Lasme ignited the crowd with a wild, two-handed slam and Bramos erased Nocioni's three-point play with a bomb from downtown, good for a 12-6 Panathinaikos lead. Nocioni kept pacing Vitoria with a close jumper, as Panathinaikos finally found the way to play against the guests' 2-3 zone defense. 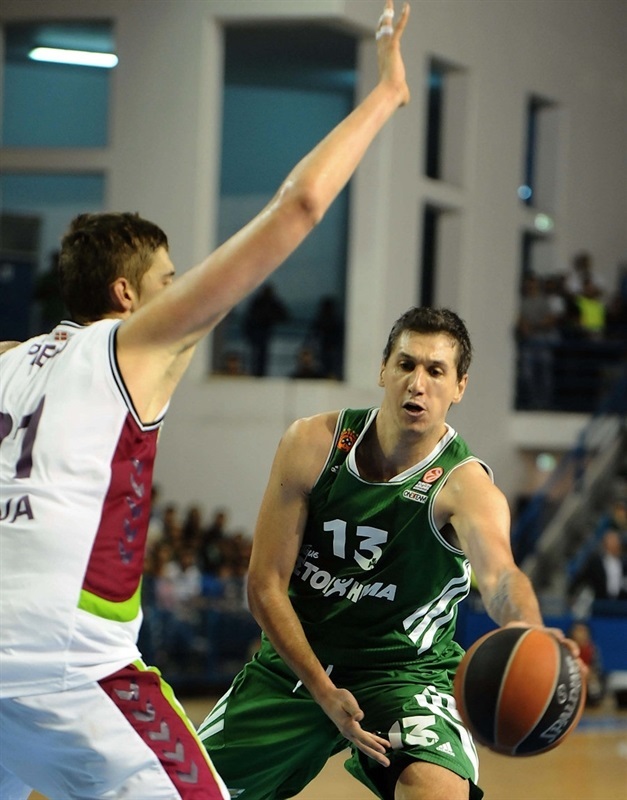 Dimitris Diamantidis punished it with a three-pointer, but Pleiss scored in transition to make it 15-10. Bramos buried his second triple and a five-meter jumper by Loukas Mavrokefalidis made it a double-digit game. Thomas Heurtel and Ramel Curry traded shots from downtown, Walter Hodge also joined the three-point shootout, but Bramos had the final word for a 26-16 Panathinaikos lead after 10 minutes. Curry shined with a reverse layup early in the second quarter, as Vitoria, due to its injury problems, tried to play with four guards and Ilimane Diop at center. David Jelinek tried to ignite the guests' comeback with a three-pointer, but Roko Ukic quickly answered from downtown for a 31-19 Panathinaikos margin. Jelinek insisted from beyond the arc, but so did Bramos, as Vitoria brought Nocioni and Pleiss back on court. Ukic sent a no-look assist to Antonis Fotsis for a dunk-and-foul, which broke the game open, 37-22. Nocioni found space for an uncontested layup that Curry bettered with another three-pointer. Fotsis scored in the paint and soon added free throws to make it a 20-point game.. Hodge made free throws and a put-back basket by Nocioni brought Vitoria a bit closer, 45-28. Curry swished a three-point shot, however, and Mike Batiste erased Nocioni's free throws with his trademark jump hook. A jumper by Hodge and a three-pointer by Nocioni brought Vitoria within 50-35 at halftime. Diamantidis buried a three-pointer immediately after the break and Maciulis copied him right after that to boost the Greens' lead to 56-35. Panathinaikos kept finding open shots, as Diamantidis struck again from downtown to cap a 9-0 run. Pleiss and Lasme traded layups and a three-point play by an unstoppable Nocioni kept Vitoria within 61-40. Gist ignited the crowd with a dunk that Hodge bettered with a three-pointer. Pleiss scored down low and a dunk by Jelinek caused the hosts to call timeout at 63-47. Diamantidis fed Gist for another monster slam, Jelinek sank a tough jumper and Bramos buried his fifth triple for a 68-49 Panathinaikos lead. Gist dunked again and Heurtel scored off a steal, but Bramos bettered them with another one from beyond the arc. Batiste and Curry hit back-to-back jumpers, but Jelinek followed a four-meter shot with a triple for a 77-56 score at the end of the third quarter. 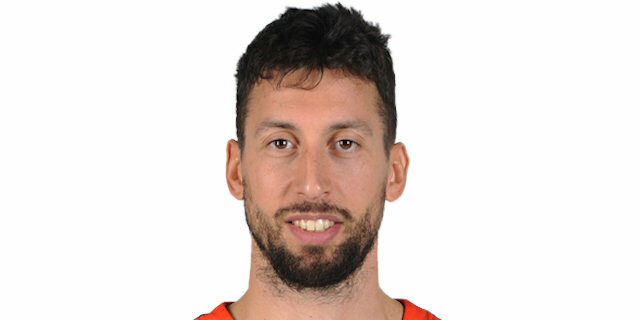 Nocioni struck from downtown early in the fourth quarter, as Panathinaikos stopped finding open shots. Pleiss soon dunked it to get the guests within 77-61 with over eight minutes to go. 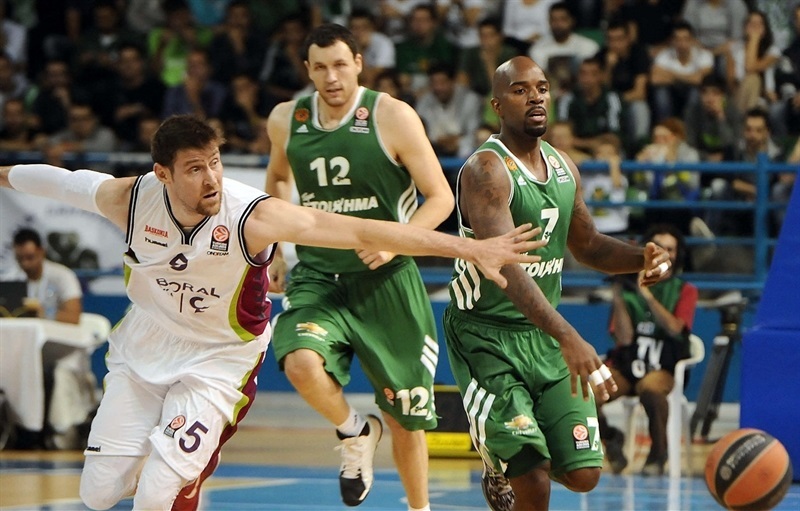 Nocioni made free throws, but a three-pointer by Ukic kept the Greens way ahead. Jelinek buried a close jumper, but Fotsis split free throws and Bramos nailed his seventh triple, bringing the Greens closer to the all-time assists record midway through the fourth quarter. Hodge downed a six-meter sho,t but he didn't find much help around. Panathinaikos kept trying to spread the floor and shooting from downtown. Curry stepped up with a fallaway jumper, which Fabien Causeur followed with a triple - his first points. By the time Lasme took over with a three-point play, everything was said and done already. Panathinaikos cruised to a convincing win and Vitoria hopes to bounce back with new signings and recovered players next week. "We are very happy for this first win in the 2013-14 Euroleague, but I have to say once again that for a such a long season it is too early for any team to be ready and play the best possible basketball. We dished 31 assists and this is a proof of the team basketball game we have to establish. Basketball is based on action and reaction. Laboral Kutxa played a zone defense for 30 minutes and that gave us the opportunity to work on the passing game and have a lot of open shots, especially from the three-point line. We thank the people here in Cyprus for the hot atmosphere and the great support." " We missed some of our players and we came here with so many problems, that we were unable to play a good game, especially in defense. 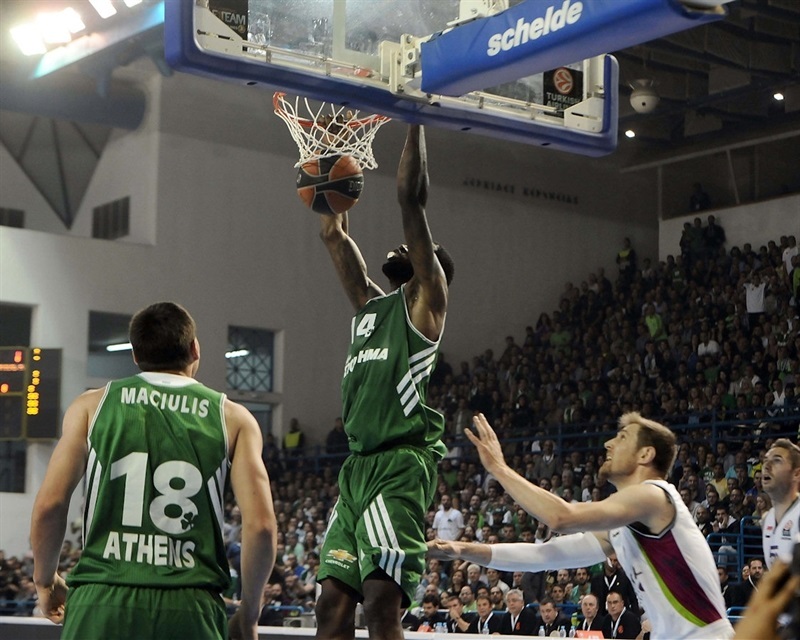 Panathinaikos had an outstanding percentage from behind the arc and that was the key of the game. They had also a very good passing game and they deserved to win. " "We were expecting Laboral Kutxa to play zone defense and they did it for 30 minutes. It was impossible for us to lose with such an impressive percentage from three-point range. Tonight we played a perfect offensive game and we showed that we have great shooters, who can punish any kind of defense. "